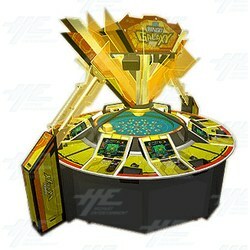 Bingo Galaxy SD is a bingo medal machine game from Sega, with 8 satellite stations. Three different coloured balls drop onto the turntable in the centre of the machine to draw the bingo numbers. This electronic bingo game has loads of features for players to enjoy and to keep players entertained and excited. On their screen players will see the main bingo card in the centre, a Bet & Odds section, a bonus card to play, a number history section, and a section showing the Super Line and the Hyper Line. This bright and futuristic looking cabinet will be sure to grab attention and stand out on any floor, attracting players fromm every corner of your location. Bingo Galaxy SD is a bingo medal machine game from Sega, with 8 satellite stations. Three different coloured balls drop onto the turntable in the centre of the machine to draw the bingo numbers. This electronic bingo game has loads of features for players to enjoy and to keep players entertained and excited. On their screen players will see the main bingo card in the centre, a Bet & Odds section, a bonus card to play, a number history section, and a section showing the Super Line and the Hyper Line. This bright and futuristic looking cabinet will be sure to grab attention and stand out on any floor, attracting players fromm every corner of your location.